Its Spring, and that may mean that you have some soon-to-be-graduating Laurels in your ward! How can we help them transition into their next role as adults? And wait a minute- when exactly do they leave YW, anyhow? When they turn 18? When they graduate? The fall after graduation? Regardless of when they actually leave YW, too many girls fall away from the church during that awkward time between leaving the Young Women program and entering Relief Society. They may be intimidated, feel out of place with the adults, or be bored out their mind with a more adult style of lesson – and any of those reasons can be excuse enough to stop attending church… ANYTHING we can do to help them make this transition successfully is vitally important! 2. Attend Relief Society class with the graduating Laurel(s). 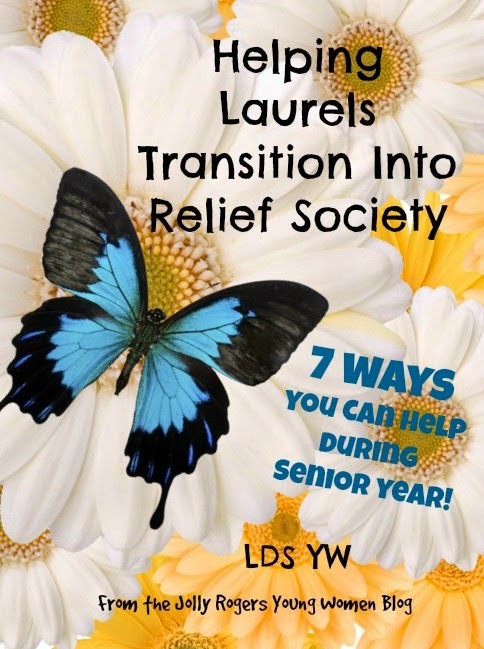 One idea that we’ve had is to have our (senior) Laurels attend Relief Society Sunday class on a regular basis (say, quarterly – or even monthly). The frequency of these visits to the Relief Society class could increase as their senior year progresses. You could start out with quarterly visits and eventually move up to every other month, then once every month. I recommend checking with your RS Presidency to see which week of the month they’d recommend. Our RS President recommended that we have Laurels attend the 4th Sunday lessons because she felt they would be most relatable to the YW. A YW leader (such as the YW President or a Laurel class Advisor) could attend class with the Laurel(s) without causing much of a disruptance with the regular teaching schedule if you plan well. For example, if a member of the YW Presidency teaches the first Sunday lesson every month, you could plan to have the YW Advisor attend Relief Society with the Laurel(s) once a month on first Sundays. Having a YW leader/Advisor attend class with them is meant to help them feel more comfortable, but if their mother is attending RS class or they are otherwise comfortable and reasonably mature, you might be able to wean off attending with them after a while. Please check with your Bishopric first to make sure that this will be appropriate. 3. Attend Enrichment activities with the graduating Laurel(s). With the permission of the RS Presidency, Laurels may start to attend the occasional Enrichment night activity. Your Enrichment Leader and/or the Relief Society Presidency should be able to suggest which activities would be most appropriate for the Laurels to attend. Attending casual activities is very helpful in socializing the YW with the adult sisters. 4. Recognize the Laurels (and all of the YW, really) for their accomplishments. I am a frequent facebook-er and I use it as a medium to point out the achievements of our YW (church-related or not) to our fellow ward members. Susie finished Personal Progress! Jane made the soccer team! Joanie won a scholarship! Ingrid got into BYU-Hawaii! Woo-hoo!!!! Personally, I am horrible with guessing ages, and all teenagers look the same age to me! Its difficult for the entire ward family to keep track of who is old enough to graduate and what all they are doing, so its nice to remind them that we’ve got some YW who will be moving up to RS soon – otherwise, they might not realize! 6. Give the graduating Laurels the opportunity to serve. Do you have a Laurel class presidency? I thought that was a standard thing for every class to have its own presidency, but I’ve been surprised to hear of many wards who don’t have class presidencies at all, or who have a single presidency for the entire group of girls. I understand that adaptations like this can be made for special circumstances (like small branches or wards with very few youth), but if you can swing it, try to have a Laurel class Presidency! This will be their last chances to lead under the mentoring of their YW Presidency. We do not have a large ward and we don’t have a huge number of YW. When I was first called to serve in YW, there was only a single presidency made up of girls from the Laurel class. These few girls did and planned everything for the other classes. We have since called separate class presidencies and each class presidency plans their own activities, works with their own less-active/inactive girls, and takes turns conducting on Sundays. We don’t always have enough active/interested girls to make up a full class presidency, and thats ok. In my opinion, its better to be missing a Counselor or a Secretary in a class presidency than to not have one. We currently have a Laurel Class Presidency of one – a President only, but that is a major opportunity for me to work with this YW and gives her a chance to lead and be responsible for something. She knows that she is being counted on. And that is a good thing. 7. Get excited about Graduation! Go to her Graduation, make cupcakes, and attend her Open House! Announce graduations in YW class opening exercises. Helping them to celebrate can help them realize that its a good thing because and they really will be moving on to bigger & better!